Only Texas, of all the states, can boast of a heritage that includes the army and navy of an independent nation. 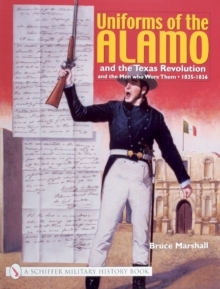 Throughout the ten turbulent years of Texas independence its military was engaged in constant warfare against enemies within and without. Its regulars were backed up by a militia described as "the most formidable, for their numbers, in the world." Contrary to the image projected by Hollywood and most historians, even in Texas, they were smartly uniformed and equipped with the latest in weaponry. What did these long-forgotten uniforms look like? Texas insignia and flags? Writer-artist-historian Bruce Marshall has discovered the answers in archives in Texas and Mexico, in old diaries and letters and sketches by those who wore or saw them. 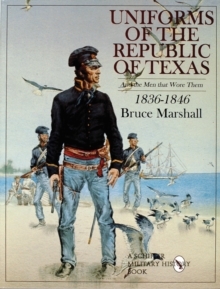 With his internationally-honored art he has recreated the uniforms in twenty-six full color illustrations, supplemented by fourteen photographs a including the only two known of uniformed officers of the Texas army and navy.